All the QuickSAT systems benefit from the patented QuickSAT elevation and alignment system which is carefully calibrated to eliminate the problems associated with the traditional type of “satellite finders”. The UK channel line up is beamed to earth using the Astra 2 satellites at 28.2° East however Astra 2 is joined in space by many other satellites and traditional meters and location devices cannot distinguish between them. Some satellites such as ASTRA 1 and Hotbird produce significantly stronger signals than Astra 2 therefore satellite finders and noise indicators read the incorrect satellites overpowering signals. QuickSAT intelligently eliminates any chance of incorrect satellite line up by guiding you to the exact elevation and position of the desired satellite and unlike other portable satellite systems the patented QuickSAT alignment system means you can be sure you are on exactly the right elevation regardless of whether the dish is on a flat surface. The QuickSAT QS65 also offers the advantage that when it is setup it has the equivalent performance of a considerably larger dish, this is due to its clever cassegrain “flat dish” design which untilises both a parabolic dish and a hyperboloidal convex reflector to focus the signal towards the LNB, this design more often seen in satellite ground stations, radio telescopes, and communication satellites also allows the LNB to be placed behind the dish rather than on an arm at the front making for a much smaller self contained unit. The whole dish and LNB assembly is housed in a durable UV protected composite plastic cover ensuring a long life. 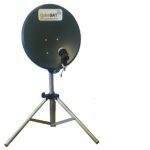 The QS65 allows you to receive the Astra 2 UK TV line up in England, Scotland, Wales, Ireland and over most of France and Germany but the QuickSAT QS80 with its 68cm diamond dish will allow you to push the limits of the Astra 2 satellites UK coverage with a portable system. 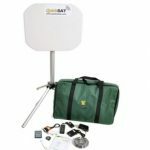 The unique shape of the diamond dish gives you you the power of a cumbersome 80cm round dish without the size and weight and as with the QS65 it includes the patented QuickSAT alignment kit for easy setup. If you want to keep the costs to a minimum and will only be travelling in the UK then the QuickSAT QS45 is a good choice, you still get the easy setup and alignment of the other QuickSAT systems but without the compactness of the QS65 or the extended range of the QS80. 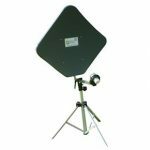 The QS45 dish is lightweight and packs down to a very small package. View the QuickSAT Coverage map here and an interactive map of reception reports here.